Used with cable tracks to enable even easier installation of cable display kits. 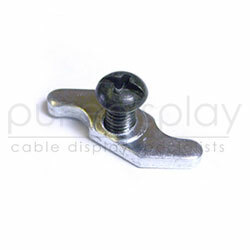 Used with our cable tracks and cable display kits or exhibition floor stands. This toggle fixture allows easy installation of a cable display kit to a cable track, by sliding along the track to the desired position. Two required for each length of cable (one at each end).